My wife, Virginia, and one of her friends were in a yarn shop trying to get proper materials for a 19th century knitting project. They observed that the names for modern yarns were no help whatsoever in choosing the proper weight yarn and the 19th century needle sizes were completely different from those of today. They decided to make themselves reference cards to carry with them in their purses or wallets so, with historic directions in hand, they would be able to get the proper yarn and needles to make a project turn out correctly when it was done. Ragged Soldier Sutlery is now offering these reference cards if you would like one or both for yourself. The first card, the Needle Conversion card, interprets a common period reference known as the Bell gauge. It converts Bell gauge sizes to both modern American and metric needle sizes. The second card, the Yarn Card, contains full-size images of modern yarns with their names. On the back of the card is a side-by-side comparison of those modern names and their period counterparts as well the wraps per inch and the yards/50 grams. $3.25 per card or $5.75 for both. 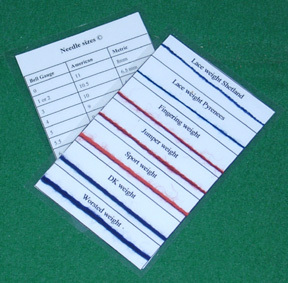 When ordering, be sure and specify whether you want the Needle Card, the Yarn Card, or both. Available wholesale. Special shipping rates for the knitting cards. If you are ordering the knitting cards only (or combined only with the crochet reference cards) , the shipping rates are $ .75 for a single card or a set (two cards, one of each). If you are ordering multiple cards or sets, please include $ .75 for every two cards. The cards will be sent via First Class mail, rather than Priority Mail. This cost includes both shipping and handling.